Louis Wright, Head of Production at Orkney Distilling. The Future of Gin asks Scotland’s gin makers and distillers their thoughts on what the future of Scottish Gin looks like. How important is sustainability, technology, geographical protection and provenance to them? 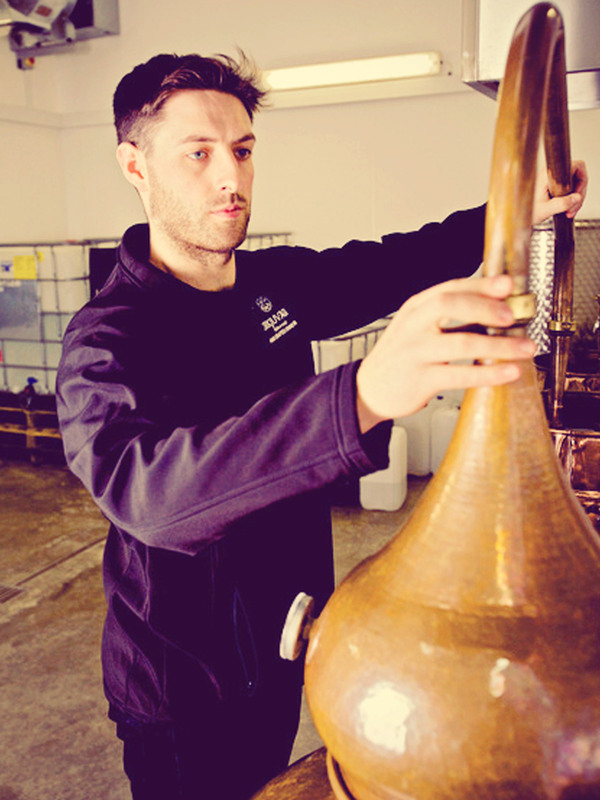 In this feature we meet Louis Wright, Head Distiller at Orkney Distilling. Based in Kirkwall at the newly opened distillery and visitor experience, Louis is in charge of distillation of all four Kirkjuvagr gins. Not only is Louis a distiller, he’s also an ‘Uppie’. The ancient Kirkwall Ba Game sees the ‘Uppies’ verses the ‘Doonies’. Along with these ancient traditions the Orkney Islands are renowned for their stunning landscape, a landscape that has shaped local folklore, the people and the spirits distilled at the Orkney Distillery. My name is Louis Wright and I work for Orkney Distilling Limited in Kirkwall – the creators of Kirkjuvagr Gin. I’m responsible for all aspects of production at the distillery. Some have said we’re currently in a gin bubble – would you agree or disagree and why? Clearly, we are experiencing a lengthy period of high demand for gin and an incredible interest in the product more widely, which has been made possible by social media. The term ‘bubble’ suggests an inevitable ‘burst’ – but I don’t think that will be the case, gin is immensely accessible, enjoyable and ultimately, timeless. That said, it is hard to see the demand for gin continuing to grow at the present rate, and I think most of us accept that the demand will slow in Britain, it remains to be seen when this will be. Where do you see Scottish Gin in 5 years time? Scotland’s food and drink producers punch well above their weight globally – especially when it comes to spirits (I’d say Orkney does remarkably well too, given its size and population). I’m certain Scottish Gin as a ‘brand’, will grow over the coming years. I can see the appeal of Scottish Gin widening around the world, as the industry learns more about itself and follows in the footsteps of our friends in the whisky industry. Most of us, it must be remembered, have only been trading for a few years and there is a lot of ground still to cover. What do you think is the ‘next big thing’ in the world of Gin? Gin Tourism – I know this isn’t necessarily a new phenomenon, but I see it becoming a much bigger part of our role as Gin producers. We have seen a huge number of beautiful visitor centres opening (ours included) and an amazing range of visitor experiences developed by producers. There are some remarkable plans for new sites around Scotland that showcase Scottish gin and with more and more people visiting Scotland, all seeking something uniquely Scottish, we are all perfectly placed to give them that experience. What would you like to see more gin makers doing in the future? I think the popular answer would be collaboration. This already happens naturally and informally. But it would be great to see more collaboration when it comes to production: pairing local botanicals and creating bespoke gins, for example. Generally, it would be great to see more companies working together. What are the long-term plans for Kirkjuvagr Orkney Distilling? We’ve been super busy since opening our new distillery, so we want to keep making sure we are offering our visitors and customers something special when they arrive. So, launching our Gin Making Experience is something we are really looking forward to. But longer term, without giving too much away, we are planning to increase our range of Gin offerings before we start exploring the potential for other spirits. Ultimately, our aim is to keep growing and to keep working to ensure that people across Scotland and Britain have the opportunity to taste our gins and hear our story. Do you think technology will play a more important role in the distillation process? Certainly, some of the systems in place in Scottish distilleries are jaw-droppingly impressive. But equally, others are quite basic, and I think that is a reflection of the different backgrounds from which producers and distillers come from. Production at the Orkney Distillery is very rudimentary – we use two direct fired, hand beaten copper pot stills – but that adds some charm to the process, and I think consumers and visitors appreciate that. Can you give an example of innovation in your business? We are exploring a range of options to harness renewable energy to power our distillery in the future. Would you like to see a Scottish producer making contract NGS? If someone could make it affordably and reliably then this would be a fantastic option and a very worthy thing to boast. Ultimately, we want a neutral spirit – so whether it is produced in Scotland or England isn’t hugely important to me as a distiller, nor from my experience is it particularly important for consumers. That is not to take away from the incredible and innovate work some Scottish distilleries already do to make their own base spirit. Should gin makers have geographical protection for their gin? Absolutely, Scottish Gins should be recognised as such. In other drinks sectors, companies that identify as Scottish, yet weren’t produced here, would face a severe backlash – but perhaps this reveals more about the nascency of Scottish Gin. Groups like The Gin Cooperative do amazing work to showcase true Scottish gins and without a legal framework to operate in, the responsibility will fall on us – those passionate about Scottish Gin – to continue to inform customers. What support would you like to see available for the Scottish Distillery and Brewery sector? The most obvious and insurmountable problem to small producers is the duty system, but it is unlikely that reform will be forthcoming. The alcohol lobby isn’t particularly powerful at present and with legislation such as MUP aiming to curb the excesses of alcohol consumption, I’m not optimistic that this will change. What would be fantastic, though, would be a more formal support network in place for trouble shooting and problem solving (I know some of these exist online) but a recognised group/body that could offer advice for new companies (and existing ones) on subjects like HMRC, health and safety, food hygiene, export and so on. Are you finding gin consumers are more aware of provenance and want to know where a gin is made and who made it? To an extent, we naturally deal with such a wide variety of consumers in different settings, from distillery tours, to shows and events. But largely, people who are passionate about Craft Gin tend to be inquisitive, knowledgeable and genuinely care about their gins’ provenance, botanicals, processes and so on. On the other hand, the expansion of the gin market has also introduced the product to a huge number of people, particularly (but not exclusively) young people, who may not have previously sought out a bottle of gin, let alone a craft-gin at a higher price point. So, we still have a lot of work to do to communicate with consumers and show them the hard-work that goes into making Scottish Gin. For us though, our Orcadian identity is fundamental to our story and to each of our products. One of the most rewarding parts of my job is being able to tell people from all over the world about our gin and how Orkney’s history and its traditions have inspired us. You can learn more about Orkney Distilling here. You can learn more about Kirkjuvagr Orkney Distilling by visiting the links below.